We always get to see the sight of construction equipment and tools when an infrastructure is being developed. These equipment appear larger to our perspective and tools that carry on its design and purpose. They may be a subject during construction development but they could also be subjects in design delivering an aesthetically pleasing design and crafted for different purposes. Below are a collection of construction icons that feature trucks, tools, equipment, safety regulations, and developed infrastructure. 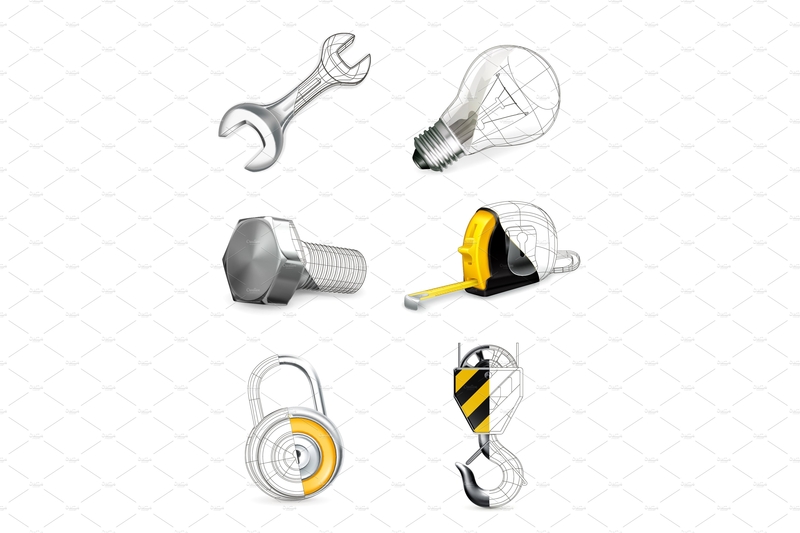 These construction icons will be a pleasing design addition to your design projects. To help you get by in using these construction icons, we have listed the different uses of the icons available that may ease up your design process. You may also go through our list of city silhouettes that will be seamless in any design projects. 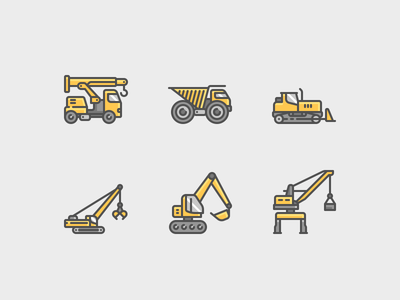 If you are looking for simple line art for icons, these construction equipment icons are a great pick. It uses a black and yellow color palette which we normally associate with the Caterpillar Brand that produces machines and construction wear that is the standard of such industry. It incorporates thin lines to balance out the supersize it is set to be. 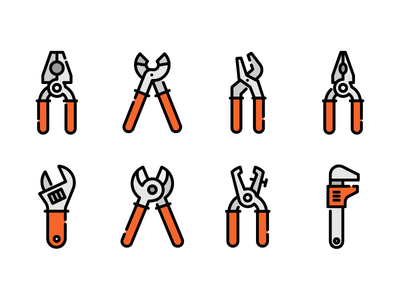 For a minimal and universal set of construction icons, this set might be for you. It is uniform in direction in terms of the tools as well as in form and design. It uses simple line art to convey its message and identification each icon. This set of icons uses a subdued color palette with neutral grays and shades of yellow. This is a more detailed design for its construction icons which incorporates the use of natural lighting to create a semi-flat appearance despite its two-dimensional form. This showcases a classic exterior for iconography; the round shapes enclosing graphical elements and use of simplicity in terms of design. The design elements are filled in with white and are outlined by its background color. This is a great set of icons to use for its universal visual communication. Visual communication. Visual communication is communicating ideas by providing a visual display of information. Visual communication is primarily identified with two-dimensional images which include iconography, signs, photography, and so on. You may utilize these icons as signs in the construction industry. Infographics. Infographics embrace the use of icons and minuscule graphics on to their design. To be honest, no one has their full attention while seeing a page filled with blocks of text. Using icons and graphics are an added benefit to readers in terms of attention and instilling of information. It also gives enough space to layout and to compose all design elements in a limited medium size. These construction icons are perfect for themes such as building infrastructure, real estate, construction, construction safety, among others. Advertising collaterals. Icons are a great addition for a user-centric advertising collaterals such as posters and brochures. Whether you use it to introduce a potential target audience towards a company that focuses on any construction related fields, or business to business commercial transaction, these icons will greatly be pleasing design elements for such purposes and collaterals. You can also apply these construction icons on audio visual presentations, advertisements, interactive designs, outdoor advertising, online banners, social media content, and so on. Educational purposes. Whether the discussion is geared towards a younger or elderly audience, the use of icons balances out the text heavy content. This gives the viewers a mental picture of the topic to introduce the content and be able to retain it afterwards. Reference for iconography. Icons incorporate different design styles, forms, and characters. This set of construction icons can be a great reference to any construction related businesses in crafting their own iconography. Reference for graphic design. These construction icons do feature two and three-dimensional perspectives which would be a great design inspiration in crafting new designs and design projects. You can refer to their design styles such as flat design, skeuomorphic, etc., as well as the varying color palettes used. Design trends reference. Icons and iconography mostly are the first things to be infused by design trends. We have seen icons take up an exterior with flat design styles to semi flat design and geometric styles and so on. It is a small canvas to work on which is why it is easy to infuse and keep up with design trends through icons. As it has been considered, constructing a building is also creating a bigger city. If you are considering adding some city flair in your designs, you may go through our list of city icons that features international landmarks that are crafted through the different design styles. The set comes along with silhouette icons, outlined and line art icons, flat design, three-dimensional and much more. These city icons will be helpful in architectural and design projects. You may also use them as future references. This set of construction icons is set in a three-dimensional perspective that displays the 360° of construction, planning, and development. It uses a simple color palette yet eye popping for viewers to be attentive. The shapes and lines are interconnected, which gives the design unity and cohesiveness. These construction icons are displayed as if it has movement but designed as static. It uses both thin and bold lines to mimic the equipment’s super size and the power. With a muted color scheme and distinct broken line design, these set of construction tools are one the sets you might need for your design. It is a simplified design without the textures but it still conveys the recognition of construction tools. This set incorporates a skeuomorphic design yet it displays the boning or construction of the tools. The icons feature the textures of materials creating this shine and smoothness. You also get to see how the raw features of the tools. While it is practiced to have safety during construction hours, in this case with design, do practice and experiment with different styles and incorporate these icons to your design projects. If you are looking for logo inspirations, you may directly view our heap of city logo designs that showcases designs for engineering, real estate, marketing, food & beverage businesses and so on.